Commercial success and critical acclaim didn’t come easy for Aretha Franklin. She was no overnight star, if such a thing exists. Her recording career started back in 1956 and she’d released ten albums before signing to Atlantic Records. Until then, success had been a stranger to Aretha Franklin. However, signing to Atlantic Records proved to be a turning point in Aretha Franklin’s career. Now signed to Atlantic Records, Aretha Franklin was about to enter a period where critical acclaim and commercial success were constant companions. Between 1967 and 1969, Aretha Franklin released five albums, which all reached number one in the US R&B Charts. This run of commercially successful albums began with 1967s I Never Loved A Man Like I Loved You and Aretha Arrives, took in 1968s Lady Soul and Aretha Now and finished with Soul ’69. Three of these albums were certified gold, including I Never Loved A Man Like I Loved You, Aretha Now and Lady Soul which was rereleased by WEA Japan on 26th March 2013. Before I tell you about the music on Lady Soul, I’ll tell you the background to what is, one of the albums that resulted in Aretha Franklin being crowned the Queen Of Soul. Lady Soul was Aretha Franklin’s third album for Atlantic Records, and was the followup to Aretha Arrives. It was her second album of 1967, a year that totally transformed her life and career. Aretha’s Atlantic Records’ debut I Never Loved A Man Like I Loved You, had reached number two in the US Billboard 200 and number one on the US R&B Charts. This resulted in the first gold disc of Aretha’s eleven album career. Proving I Never Loved A Man Like I Loved You was no fluke, was Aretha Arrives, released later in 1967. Aretha Arrives reach number five in the US Billboard 200 and reached number one in the US R&B Charts. Like I Never Loved A Man Like I Loved You, Aretha Arrives featured two US R&B number one singles, which were certified gold. It seemed Aretha Franklin, guided by producer Jerry Wexler, had the Midas Touch. Would this continue with her third album for Atlantic Records, Lady Soul? For Lady Soul, Aretha and her husband Ted White cowrote Sweet Sweet Baby (Since You’ve Been Gone) and Good To Me As I Am To You, while Aretha’s sister Carolyn contributed Ain’t No Way. Some of the other tracks were written by some of the best songwriters and musicians of that time. This included Don Covay’s Chain Of Fools, Curtis Mayfield’s People Get Ready and Gerry Goffin, Carole King and Jerry Wexler’s (You Make Me Feel) Like A Natural Woman. James Brown and Nat Jones contributed Money Won’t Change You, Felix Cavaliere and Eddie Brigat’s Groovin’ and Walter Davis’ Come Back Baby. The other track on Lady Soul was Niki Hoeky, penned by J. Leslie McFarland and Sidney Wyche. These ten tracks were recorded in New York, at Atlantic Studios. When Aretha entered the Atlantic recording studios in New York, Jerry Wexler had assembled a tight, talented band. This included a rhythm section of drummer Roger Hawkins, bassist Tom Cogbill and guitarists Jimmy Johnson, Joe South and Bobby Womack. Spooner Oldham played piano and organ, while tenor saxophonist King Curtis was part of a horn section. Backing vocals came from the legendary Sweet Inspirations. Once Lady Soul was recorded, it was released in January 1968. Lady Soul was released in January 1968, reaching number two in the US Billboard 200 and number one in the US R&B Charts. Since Lady Soul’s release, it’s been recognized as one of the most important albums in the history of popular music. Rolling Stone magazine put Lady Soul at number eighty-four in their list of the 500 most important albums of all time. The lead single from Lady Soul was (You Make Me Feel) Like A Natural Woman, which reached number eight in the US Billboard 100 and number two in the US R&B Charts. Chain Of Fools reached number two in the US Billboard 100 and number one in the US R&B Charts. This resulted in Aretha’s fifth gold disc for a single. Then Sweet Sweet Baby (Since You’ve Been Gone) made it gold disc number six, after reaching number number five in the US Billboard 100 and number one in the US R&B Charts. Ain’t No Way, the B-side to Sweet Sweet Baby (Since You’ve Been Gone) then reached number sixteen in the US Billboard 100 and number nine in the US R&B Charts. Aretha had regained her crown. She was still the Queen Of Soul, after the release of Lady Soul. You’ll realize why, when I tell you about this hugely important album. Opening Lady Soul, is Chain of Fools, which has that familiar opening. Brief bursts of guitar set the scene for Aretha, accompanied by The Sweet Inspirations. She delivers an angry, frustated vocal. Her voice is powerful and emotive, as she sings about being mistreated by her partner. Accompanying Aretha, are sweeping harmonies. They soar high, proving the perfect accompaniment Aretha, while the rhythm section drive the arrangement along, providing its heartbeat. Stealing the show, is Aretha’s emotive, angry vocal, filled with disappointment, disbelief and hurt. Truly, her vocal is a Magnus Opus, that played its part in Chain Of Fools becoming a timeless, soul classic. James Brown and Nat Jones cowrote Money Won’t Change You. It burst dramatically into life. Guitars and drums combine before Aretha’s vocal enters. Like on Chain of Fools, her vocal is a mixture of controlled power and emotion.The tempo is quick, with horns and the rhythm section creating a relentless, driving sound. Horns blaze, drums pound while guitars soar and chime. The Sweet Inspirations accompany Aretha, their soulful interjections a contrast to Aretha’s powerful, emotive, soaring vocal. Aretha and her band kick loose. The powerful, driving arrangement proves a perfect foil to her vocal, as Aretha mixes sincerity and emotion, confidently forecasting that money won’t change her. If you mention the song People Get Ready to most people, they associate Curtis Mayfield with the song, either as a solo artist or with The Impressions. Aretha’s cover is emotive, thoughtful and soulful, but with gospel-tinged. Just The Sweet Inspirations, rasping horns and piano accompany Aretha’s impassioned pleas. When the rhythm section and Hammond organ enter, the gospel influence grows. Aretha’s gospel influenced delivery is spine-tingling, helped no end by The Sweet Inspirations. Similarly, the band produce one of their best performances on Lady Soul. They play their part in bringing the song to life, and in the process, bringing out the meaning in the almost spiritual lyrics. By the end of the track, you feel privileged to have heard such a beautiful song, sung with such emotion and feeling. Blazing horns, a pounding rhythm section and searing, chiming guitars set the scene for Aretha as Niki Hoeky unfolds. Aretha delivers a sassy, feisty vocal accompanied by The Sweet Inspirations. Their short, soulful interjections provide a contrast to Aretha’s powerful vocal. Her voice combines control, power and sensuality as she realistically, plays the part of a woman whose partner is in prison. Despite Aretha, The Sweet Inspirations and her band’s best efforts to make the song swing, the lyrics let the song down. Ultimately, it’s a disappointing track. (You Make Me Feel Like) A Natural Woman is a song Aretha made her own. With Spooner Oldham playing piano, Aretha starts to sing what was, a career defining song. Her voice is strong, laden in emotion and feeling, as she delivers the lyrics. The Sweet Inspirations, short soulful interjections, punctuate the track, while strings sweep grandly, and a strong, slow bass line provides the heartbeat. Spooner Oldman’s performance on piano is crucial to the track’s success. He gives the performance of a lifetime.Meanwhile, Aretha’s heartfelt, impassioned delivery is a mixture of passion and emotion. This results in one of the most heartachingly beautiful songs in the history of soul music. Whether Aretha or Jerry Wexler realized the importance of the song in 1967, when it was recorded, we’ll never know. What we do know, is it’s a timeless, classic. Since You’ve Been Gone (Sweet Sweet Baby) is the first of two songs Aretha cowrote with her husband Ted White. As Aretha’s powerful vocal soars above the arrangement, the rhythm section, piano and rasping horns accompany her. A joyous sounding arrangement unfolds. Aretha mixes power, emotion, drama and a touch of sass, as she sings about her man leaving her. The Sweet Inspirations’ gospel-tinged harmonies prove the perfect foil to Aretha’s vocal masterclass on a track that gave Aretha her sixth number one US R&B single. Ted White and Aretha cowrote Good To Me As I Am To You. It has a subtle, understated introduction. Just piano and guitar combine before Aretha sings. This subtle backdrop suits the song, with Aretha’s voice taking centre-stage. Quickly, the arrangement grows, with the rhythm and rasping horns entering. Aretha’s vocal and the arrangement grow in drama, power and emotion. Powerful, passionate and controlled. Aretha warns her man, you’d better be good to me. By now, she’s almost shouting the lyrics, accompanied by soaring, screaming guitars and throwing in the odd whoop and holler for good measure. As the track ends, you can only admire Aretha’s controlled power, and almost aggressive vocal. She can bring a song to life, inject meaning and feeling, that other vocalists fail to do. Growling horns open Come Back Baby track that has a really quick tempo, driven along by a melange of rhythm section and Hammond organ. The Sweet Inspirations live up to their name. Their sweet and soulful interjections help inspire Aretha. Her delivery is quick and soulful. It rises and falls, a combination of restrained power and emotion. Likewise, the arrangement has a joyous sound, with horns blazing, guitars chiming and the rhythm section driving the arrangement along. They seem to take their lead from Aretha’s emotive, impassioned vocal, matching her every step of the way. Groovin’ was originally recorded by The Young Rascals, who for me, recorded the definitive version of this song. Here Aretha interprets the track. Just the rhythm section and Hammond organ combine brightly and melodically as Aretha sings. The song is slowed down, with Spooner Oldham’s atmospheric Hammond organ and The Sweet Inspirations tender, subtle harmonies playing important roles. Aretha gives a much more gentle, restrained and soulful vocal. Behind her, a beautiful and understated arrangement unfolds. Add to the arrangement, Aretha’s thoughtful and soulful vocal, and this is one of the best versions of this song I’ve ever heard. Ain’t No Way closes Lady Soul and was written by Carolyn Franklin. A piano, slow sultry horns and drums combine, before Aretha’s vocal enters. It’s hugely emotive, thoughtful and drenched in horns, with Cissy Houston contributing vocal obbligato. The Sweet Inspirations add tender harmonies, while rasping horns punctuate the arrangement, and lush strings sweep. By now the arrangement has a grand but soulful sound, with Aretha’s voice soaring emotionally and powerfully heavenwards. Behind her, one of the best arrangements on Lady Soul unfolds. Elements of a big band sound combines with the best soul music has to offer. This is potent and beautiful mixture, made all the better by Aretha’s brilliant vocal and a stunning contribution from Cissy Houston. It’s the perfect way to end Lady Soul, one of the best albums Aretha Franklin ever recorded. During Aretha Franklin’s long and illustrious career she has recored many great albums and received critical acclaim, awards and plaudits aplenty. Aretha won eighteen Grammy Awards, had twenty R&B number one singles, with ten of her albums topping the R&B Chart. Then there’s the small matter of thirty-eight studio albums. However, Aretha Franklin’s best music was the albums she recorded between 1967 and 1969. Starting with 1967s I Never Loved A Man Like I Loved You and Aretha Arrives, taking in 1968s Lady Soul and Aretha Now and finishing with Soul ’69, these albums are Aretha’s finest. The other album I’d include is 1972s Young, Gifted and Black. 1969s Lady is undoubtably one of Aretha Franklin’s greatest albums. Lady Soul features two songs that Aretha made her own, Chain of Fools and (You Make Me Feel Like) A Natural Woman. Not only have both songs since become synonymous with Aretha, they’ve become two of her best known, and best loved tracks. On Lady Soul, Aretha also gave stunning interpretations of People Get Ready, Come Back Baby and Groovin.’Demonstrating her talents as a songwriter are two tracks Aretha cowrote with her husband Ted White for Lady Soul. These are the US R&B number one single Since You’ve Been Gone (Sweet Sweet Baby), and Good To Me As I Am To You. Then on Money Won’t Change You and Come Back Baby, Aretha breathes life, meaning and emotion into the tracks. She transforms these tracks, especially Money Won’t Change You, which in the hands of a less talented vocalist, may come across as an average track. The only track on Lady Soul which disappoints is Niki Hoeky, which despite the best efforts of Aretha, The Sweet Inspirations and her band, never rises above mere mediocre. That’s the only track that stops Lady Soul from being a flawless album. Whether its sadness, hurt and heartache, frustration, anger or emotion, or confidence, sass and sensuality, Aretha Franklin could bring all these things and more to a song. She has you believing she’s lived and survived the lyrics. 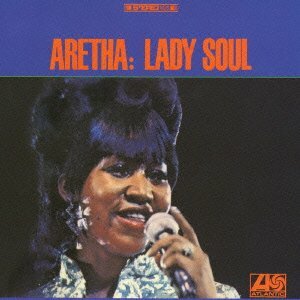 Lady Soul, which was rereleased by WEA Japan on 26th March 2013, is one of Aretha Franklin’s classic albums. As such, Lady Soul belongs in every record collection. Quite simply, it features Aretha Franklin at her very best. To me, Lady Soul is the perfect introduction to the career of one of the greatest female soul singers of all time. Standout Tracks: Chain of Fools, People Get Ready, (You Make Me Feel Like) A Natural Woman and Ain’t No Way. ← PAAAARTY TIME-SERIOUS FUNK FROM THE 70S.